SeaCure Moving is New Jersey’s premier office movers that can meet and exceed your expectations for a seamless office transition. For over 30 years, SeaCure Moving has been well known for our quality service and dedication to customer satisfaction, and as a New Jersey office mover we have earned BBB-accreditation and ProMover membership in the American Moving & Storage Association (AMSA). Whether you have two cubicles or two hundred, our office movers will help meet your goals. 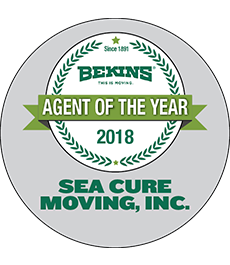 SeaCure Moving is an agent of Bekins Van Lines, which means that we can offer you full-service office moves to any local, long distance, or international destination. Our office moving teams in New Jersey are continuously trained and have access to modern moving technology such as air-ride suspension, conveyors, forklifts and even sky cranes to move the most specialized commercial equipment. As New Jersey’s office movers we want to work your local business and staff to ensure efficiency from start to finish. To do so we will assign you an experienced office Move Coordinator who will be assigned to your relocation. Your Coordinator will help you create a custom moving plan that addresses and unique needs. At SeaCure, customer service is our number one priority. Don’t delay, and call us today or fill out a quote form for a FREE no hassle quote.